Whole Foods Market is known for serving customers organic and natural products that meet certain standards, but sometimes it get’s a bad rap for being expensive. It doesn’t have to be though if you are a smart shopper! 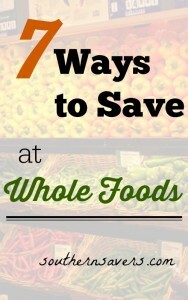 Follow the 7 tips below and you will be ready to save money on next or first shopping trip at Whole Foods Market. And, if you choose to take the kiddos along, look for the Kids Club Wagon filled with yummy snacks to keep them happy while you shop. You can find store coupons in a small booklet called the Whole Deal booklet. The Whole Deal booklet averages around 30 to 40 coupons and changes every two months. You can also print the coupons that are in the Whole Deal booklet on the Whole Foods website. We will see a new booklet for May soon, so stay tuned for those new coupons to be found in the Coupon Database. One extra thing to note about the store coupons is that there is not a limit to the number of store coupons you use, just a limit of one coupon per product that you have. In my experience, I let the cashier know the number of items I have and give them one coupon. They will then take the value of the store coupon off the number of products I have. Just like other grocery stores, Whole Foods offers a weekly store flyer that starts on Wednesdays and ends on Tuesdays. The flyer lists the main items on sale during the week and they vary by region. You can find all the best deals and sales I’ve found this week in the Whole Foods Weekly Ad. Each weekend you find different deals in several departments that they advertise as a Hot Weekend Deal. The deal usually lasts from Friday to Sunday and will vary by store. To give you an example of a Hot Weekend Deal, my local Whole Foods had all facial care products 20% off. Some of the items were already on sale, so you can stack the 20% off deal with the sale price! Similar to the Hot Weekend Deal, Whole Foods also has One Day Sales that can vary by store. The One Day Sale is on Fridays and you can usually see posters advertising the deal by the Wednesday before. This week at my store, you can get Wild Alaskan COHO Salmon fillets for $8.99 lb (reg. $15.99 lb). For these deals there is usually no limit! So you can stock up on whatever is an awesome price. We’ve seen organic blueberries for 99¢ lb, organic whole chicken for $1.99 lb (tends to be in February) and lots of other deals. If you love cooking with marinated meat but are looking to cut time and cost, ask the butcher in the meat department to marinate your choice of meat. They do this for FREE! To get the best deal, make sure to look at the selection of meats on sale or ask for a recommendation for the best meal with lowest price. If you see something that you want more than just a few of the item, you can purchase a case and get a 10% discount. If you are purchasing wine for an upcoming party and purchase at least (6) bottles, you can get 10% off your purchase. The case amount will vary by product, but you can ask any Whole Foods Team Member for correct quantity to receive the discount. You would still be able to use a coupon on each item you’re buying so this is an extra savings! If you have some extra bags lying around, you can use them as your grocery bags and save 10¢ per bag off your total. This is just another small way to save that can help boost your savings in the end. 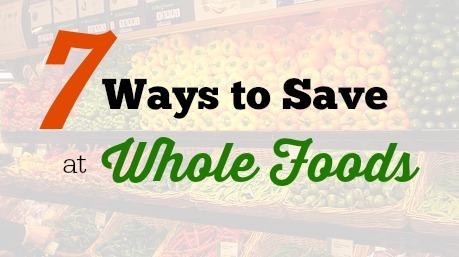 Do you have any other tips for saving at Whole Foods?